Joan Barreda, the Monster Energy Honda Team ace, comes away from the Dakar having clinched four stages. Not only has he proven to be the fastest and most complete all-round rider of the 144 bike category participants who set off from Paraguay, but he also displayed superior navigation skills and made fewer mistakes. Once again Barreda scooped more stage wins than anyone, taking the tally to eighteen and overtaking the previous record-holder Italian Edi Orioli, who won with Honda in 1988. A harsh one-hour penalty for different interpretations of the refuelling guidelines effectively stole the bronze Tuareg from the Spaniard’s hands. 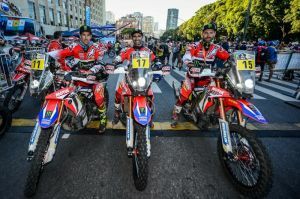 Rally’s most promising rider had to accept fifth when the curtain came down on the event in Buenos Aires. Michael Metge revelled in his supporting role and constantly shadowed the team’s two main riders Joan Barreda and Paulo Gonçalves. The Frenchman offered his team-mates a sense of security which allowed them to give the maximum on the track. American Ricky Brabec will forever remember the Dakar 2017 after snatching his first Dakar stage win. Ricky was unable to finish after a crash damaged the bike. Ricky, however, has shown excellent progress and maturity as a rider of cross-country rallies.